Increasing industrialization as well as rising need for energy efficiency and industrial automation are driving the growth of electric drives market in India. Different industry verticals including oil & gas, food & beverages, mining, cement, paper & pulp and others are readily deploying electric drives to reduce carbon emission and energy conservation. Among various end-users, oil & gas, water & wastewater treatment, power generation industries majorly installed electric drives to achieve operational efficiency and reduce their carbon footprints. During 2017-23, water and wastewater treatment is likely to exhibit highest growth owing to increasing investments in the industry. The India electric drives market report thoroughly covers electric drives market by applications, end users, voltage levels and types of drives. 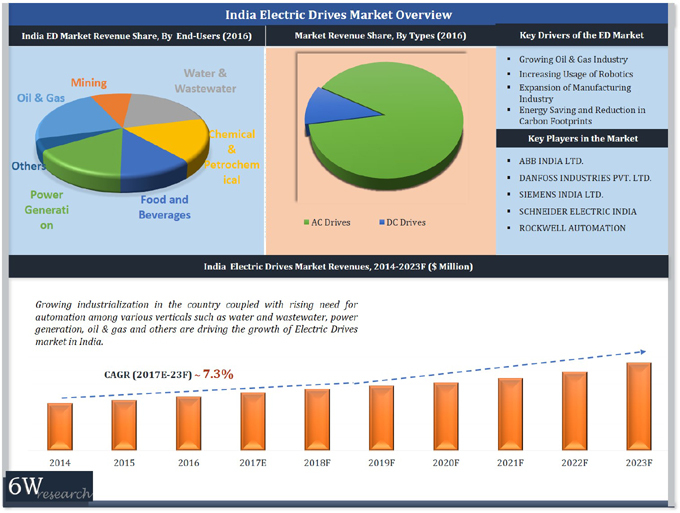 The India electric drives market outlook report provides an unbiased and detailed analysis of the India electric drives market trends, opportunities/ high growth areas, market drivers which would help the stakeholders to decide and align their market strategies according to the current and future market dynamics. 12.2	Danfoss Industries Pvt. Ltd.
12.4	Schneider Electric India Pvt. Ltd.
12.5	Rockwell Automation India Pvt. Ltd.
12.6	Mitsubishi Eelctric India Pvt. Ltd.
12.7	Yaskawa India Pvt. Ltd.
12.8	Fuji Electric India Pvt. Ltd.
12.9	Hitachi India Pvt. Ltd.
12.10	Larsen & Toubro Ltd.